This past Saturday, I went hunting with lawdog1 from the Friendly Metal Detecting Forum. We began by hunting some sidewalk strips and an old park. After a couple of hours, my friend told me that he was thinking about going up the street and asking for permission to hunt an empty lot next to a liquor store. So off we went. Turned out the lot next to the liquor store had been detected multiple times according to the store attendant so my friend decided to ask for permission to hunt a 1927 house instead. After he was granted permission and we hunted the place –I found some wheats and some clad, I was inspired by my friend’s nonchalant attitude towards asking to detect the yard. Since I had stayed in the car while he procured access to the house, I did not get to listen to his pitch. I asked him how he did it and he gave me a couple of pointers. So at lunch today, I decided to give this a try. I selected a soft target; a social agency that is housed in a very old house in a very old neighborhood. Thanks to my city’s tax database, I was able to discover that the house was built in 1901 so I was eager to see what was under that dirt! I went in and introduced myself as suggested by my friend from the forum. After about a ten minute conversation with one of the Directors of the agency, he granted me permission to detect the yard. Awesome! The yard itself was tiny. Both front yard and back yard looked like they had been worked on, possibly some utility work. 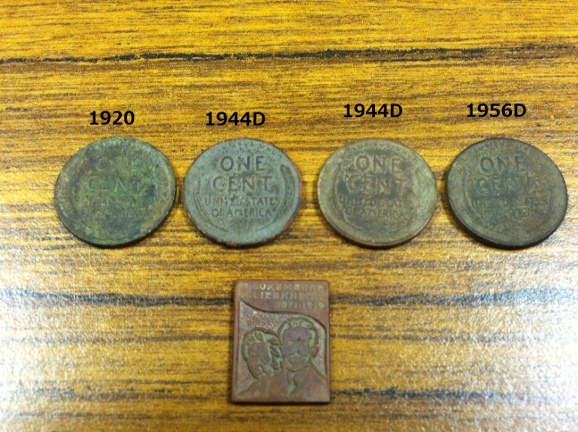 I managed to find four wheat cents: a 1920, two 1944D, one 1956D and some clad. I also found a small brass plaque with the names of two German Socialists from the turn of the century: Rosa Luxemburg and Karl Liebeknecht. No silver but the experience was worth a lot to me. Although the place was not someone’s house, it was still private property and it was still a cold call. I now have lost some of the apprehension of asking for permission to hunt a private property. I feel a whole new world of opportunity has opened up in my quest for old coins! I hunted with the V3i again today. I am getting more and more comfortable with the sounds and with each program. Today I spent the morning trying to detect a dime that I buried ten inches deep at my favorite park. Unfortunately, I could not repeat the magic at the park that I did in my yard. At least not yet. I still have a ways to go before I master all the relationships between settings in the V3i. I may be able to squeeze more depth from it yet. As things stand however, I can detect a dime at eight inches fairly well at that park. I think I may detect the dime at nine inches with an iffy signal. I should have tested but I only tested at ten and eight inches. 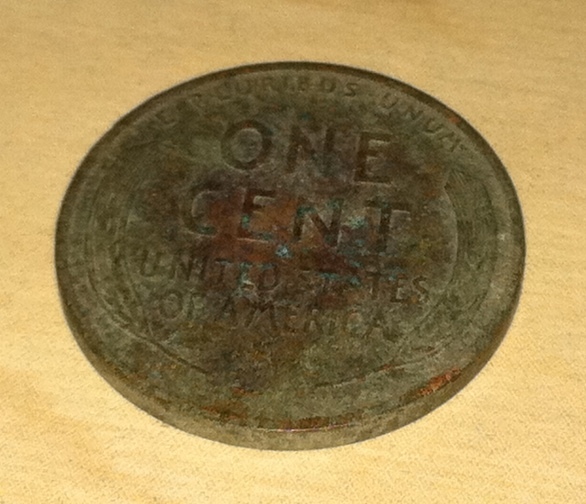 Before I left the park I managed to find a 1941D wheat which I misplaced in my car somewhere. Later, I met with Patton from the Friendly Metal Detecting Forum and we hunted a park he found hidden away in a neighborhood. I looked up the park on the Internet and learned that although the park is very new (1998), the site is an old school site. We didn’t find anything of note (I found a flattened memorial penny) but we did get to see the park surrounded by sheriff officers. We don’t know what was going on. Patton had errands to run and I went to the park where a couple of large cents (I still can’t believe it) and a Morgan dollar were found this Fall. 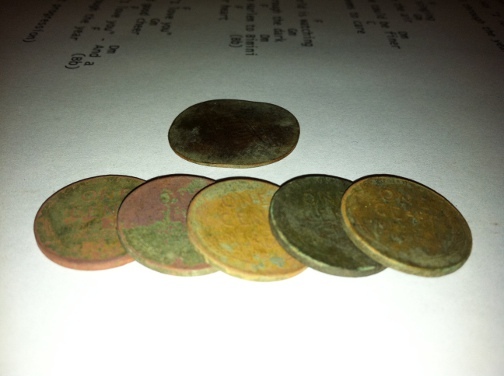 I managed to pull five wheats, including the oldest coin so far with my new V3i, a 1936S wheat penny. I hope to continue to find older and older coins, including lots of silver soon! I went hunting with a member from the Friendly Metal Detecting Forum and I took only my V3i. 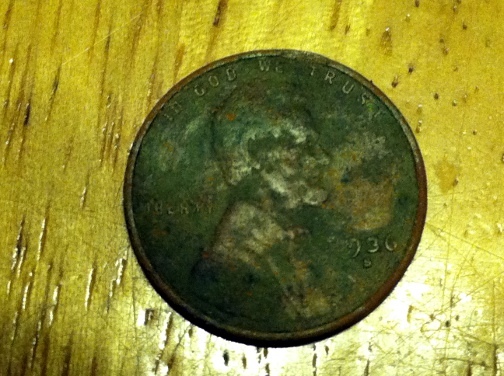 Right off the bat, within the first hour of the hunt, Patton found a really nice 1911 V Nickel. Later, we moved on to a site where a school once stood early in the 2oth century (that’s weird to write, since it is now the 21st century!) 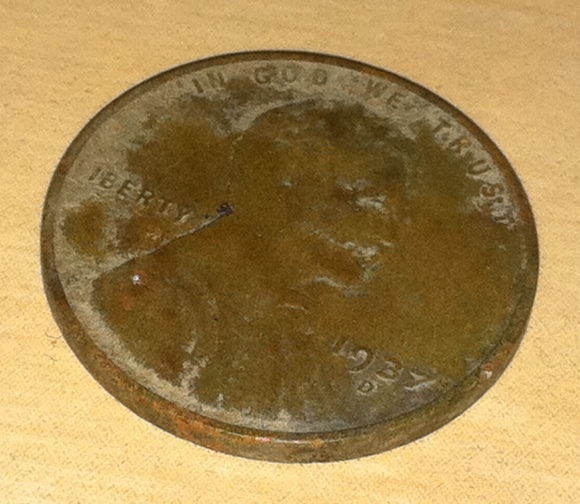 and it was there that I found this 1937 D wheat penny. Sure, it’s just a wheat but it is significant in that I found it with the V3i at a little over six inches deep. And as significant is the fact that I found it while hunting with a high degree of comfort and confidence. I can categorically assert that I am now HUNTING with the V3i. There is still much to learn and much skill to attain but I believe I have enough mastery of the V3i to hunt with it and find stuff. I have concentrated in three programs: Deep Silver, Hi-Pro, and Coin & Jewelry. I said it before and I’ll say it again; I expect great things from this detector! At lunch time I went to the bad park. I have hunted this park before and only found clad. This time however, I found three wheat cents in the same general area so I think silver from the bad park may soon be forthcoming. 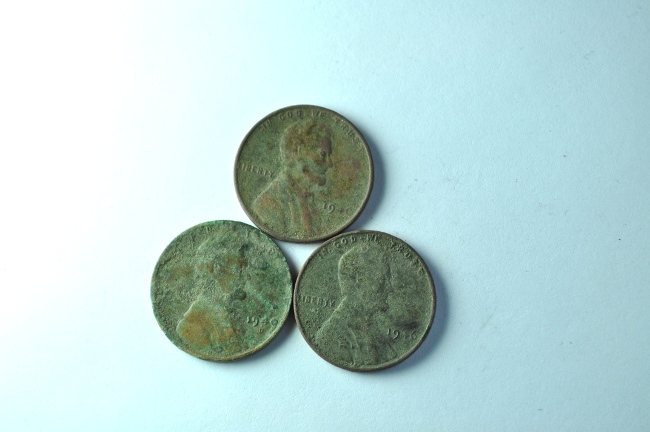 The wheat Lincolns were: two 1946 pennies with no mint mark and one 1949 D penny. All signals were good and solid and they read 80-81 in the Target ID of the AT Pro. A sign of silver times ahead!